How did we get here? How did this happen? What made everything so that you are there reading this and we are here anticipating our next line? In other words, what was the cause of all this??? When you are writing a cause and effect essay, these are the types of questions you might encounter. It may seem like a lot to bite off, but if you take a step back and try to adopt a macro perspective before launching into the micro, you’ll have a better chance of making sense of it all. In this article, we’ll examine the cause and effect essay and share our thoughts on how you can make yours great! A cause and effect essay is an essay in which a claim is made regarding a cause that has a discernible impact, outcome or effect that can be traced back to the initial action. The essay outlines or shows how the cause leads to the effect and supports the claim with research. The essay can also be written by taking a subject—such as the Vietnam War—and identifying what caused it and what its effects were. You’re essentially looking at a handful of actions and reactions and trying to make sense of them. Establish a logical explanation for how the actions and reactions fit together—and you’ll have a solid essay ready to go! The essay should begin with an introduction that includes a thesis statement. A thesis statement is a sentence that describes the main point of your essay. If you’re writing about the opioid crisis in the U.S., you would want to identify the cause and the effect of the crisis in your thesis statement. The thesis statement should come at the end of the introductory paragraph. The first part of the paragraph should lead into the thesis by giving some background information on the subject. So if, for instance, your subject was the opioid epidemic, you might start off your intro by leading with a statistic, such as: Nearly 100 people die every day in the U.S. because of opioids (Rudd et al., 2016). Remember: when you provide data that is not well known by the public, always be sure to cite the information. To learn more about how to cite sources, check out our citation guides. Your lead-in will be followed by more background info on the subject as you build your case for your thesis, which will close out your opening paragraph and give the reader clear and concise direction on where the paper is headed. Let’s examine how it all works in some detail. First let’s look at the parts of a cause and effect essay. We’ve already described the Introduction for you. What follows is the Body of the essay. The Body is where you flesh out your essay by providing supporting evidence and arguments that help your paper to make its main point—i.e., your thesis. Each paragraph of your Body should be devoted to a single topic that supports the main idea or intent of the essay. In this case, it would either expand on the cause(s) of the subject or explain the effect(s) of the subject. The minimum standard for the Body is three paragraphs. However, if you are writing a more detailed paper, your Body will more than likely be much longer. The Conclusion sums up the paper. It comes at the end and should be one paragraph that concisely restates the main points or arguments of the essay and the main idea that the essay has intended to show or prove. The first step is to pick a great cause and effect essay topic. A good topic for this kind of essay will be one that has a solid history to it or that is at the center of a string of events. Wars are typically great topics because every war has a cause and an effect. Look for subjects that have a chain of events to them—a starting point and an end point. Social movements are good topics as well. The Civil Rights Movement, or the Women’s Movement, or the Protestant Reformation, or the Bolshevik Revolution—all of these have causes and effects that can be researched and explained in a five paragraph essay. Once you identify your topic, begin to research it. You can go to Wikipedia, for instance, to develop a basic understanding of the subject—but you will want to expand your research beyond Wikipedia in order to write a good essay. If you can gather sources from a wide variety of places, your essay will appear more authoritative than if you based all your research on a single source. Be honest and ask questions about your subject—and then try to answer them by looking for answers in the sources available to you. The more questions you ask, the more likely your research is to pay off. Jot down notes so that you can connect the dots between causes and outcomes along the way. Basically you should be able to construct an historical timeline of events that illustrates the cause and effect of your subject within a given period. Don’t wait until you’ve “done all the research” to start writing. Writing while you research helps you to put ideas together and process what you are uncovering about your topic. Your writing doesn’t have to be perfect—it’s more about exercising your skills at this point. The idea is to begin putting words on paper so that you can see what you have. The more information you obtain, the harder it will be for you to actually start composing your essay once you have a mountain of data in front of you: you’re likely to feel overwhelmed. Don’t worry if you uncover information later on that contradicts what you’ve already written! That’s the point: you can always go back and revise. In fact, revision makes your writing that much stronger. It might seem counter-intuitive to create an outline after you’ve already begun writing. It’s actually a really helpful exercise, however, because it allows you to take what you have, organize it, and order it more effectively. Consider your initial writing as a rough, rough draft. It is a way for you to familiarize yourself with the subject. As you wind down your research and answer all your questions, start thinking about what the best way to introduce your topic would be. Come up with a hook—a piece of information that will surprise your reader and attract the reader’s interest—which you can use to start off your paper. A startling figure will do the trick, or a piece of trivia about your subject that you can tie into your thesis will work. Use this hook to start off your outline, and then identify your thesis—the main point which you will prove in your writing; after that, sketch out the direction that your Body will take: show how you prove your thesis by providing supporting details. Round out the outline with a Conclusion and re-cap what you paper shows. This will serve as a great road map for you as you go back to create your rough draft. Your earlier rough, rough draft helps because it allows you to see what works and what doesn’t, what is essential to your main idea and what is not. The rough, rough draft will allow you to construct a great outline—and that outline in turn will allow you to construct a great first draft. Write the rough (or first) draft by following the outline you just created. If parts of your rough, rough draft work for the purposes of your outline, simply plug them in and go. Once you finish composing your rough draft, go back and edit it to ensure that it has cohesion, consistency, flow, no grammar or logic mistakes, and stays focused on your main idea. Be sure to make use of transition words and phrases where appropriate. Some potential topics for a good cause and effect essay are, as has already been noted, usually rooted in some large social or geopolitical event. Such events have a lot of moving parts and are great subjects for researchers looking to explain how x, y and z all fit together. Again, we have a good list of other cause and effect essay topics you can feel free to peruse as well! One of the most celebrated leaders of this movement—MLK, Jr.—was assassinated. Racial tensions still exist. Equal rights may have been granted—but the concept of equality is still contended. So what caused this movement, and what were the short-term and long-term effects? The anti-Imperialists were horrified at the thought of an American Empire sprawling across the globe. That was a hundred years ago. (What would they think now?) Mark Twain, Andrew Carnegie, and William James were just a few of its notable members. Describe the cause of the rise of this League and what effect (if any) they actually had on events. The enshrinement of Reason was not supposed to lead to a total blood-letting and Age of Terror—and yet that is precisely what happened in France during this time. Why and How? Look into it: the subject makes for fascinating reading for any student of history. The Tsar fell, and the Soviet State rose. Tensions did not end, however. Discuss the cause and effect of this Revolution, how it happened and impacted Russia, and what conflicts inevitably emerged across Europe as a result of it. This era changed the world and introduced machine power at a level never before seen. How did it come about? What forces prompted its birth? And how did life change as a result—economically, politically, socially, and even spiritually? There’s a lot to sink your teeth into with a topic like this—so go big—or small (whatever you’re comfortable with). A great era to research when it comes to causes and effects. “Remember the Maine!” was the cry that set things in motion. Why? And what happened as a result? That’s prime fodder for a solid essay. Zwingli, Luther, Calvin, Knox and many others acted as catalysts of the Protestant revolt. Wars followed, excommunications were delivered, and nations were altered forever. It’s a great topic for one interested in examining the causes and effects of one of the most critical moments in Western history. The origin of this topic is pretty clear: the Roman Catholic Church needed to swing back against the Protestant movement sweeping across Europe. What effect did this counter-punch have on society—in the arts, in politics, and in religion? It is no mystery why the Roman Empire fell; neither is it a mystery about what happened next. Examine the details, the evidence, the facts and the stories and put them together to compose a neat essay that describes the cause and effect of the fall of Rome. Religions, their origins and their effects on society are great places to start when considering topics for a cause and effect essay. You can look at early religious leaders, founders, social factors and political events that helped shape outcomes as well regarding your religion of choice. Climate change is a topic that gets talked about a lot—especially when half a dozen hurricanes start barreling around in the Gulf/Atlantic threatening U.S. shores. Is it for real—or is it part of the “shock doctrine” as Naomi Klein argues? They’ve made movies about it, written books on it, and extrapolated all manner of data: so if you wanted to write a solid cause and effect essay on the housing bubble that triggered the 2008 global economic crisis, you’ll have a lot of material to choose from. Populism? Nationalism? Social Media? Journalism? Russian meddling? How did it happen—and, more importantly, what will it mean for America and for the world? The rise and fall of the Iraqi dictator could be a very good topic for a cause and effect essay, once the idea of American foreign policy is incorporated into the mix. With unconventional monetary policy ripping across economies around the globe, crypto has taken off. Speculative bubble? Or sign of impending doom for local currencies? Research and decide! Historically low interest rates and historically easy credit: two factors that have clear origins and even clearer consequences according to some. The price of oil impacts economies all over the world. Petroleum is used in so many products, and so many countries rely upon it (either for imports or exports) that the market value of crude can make or break nations. What causes the price to go up or down and what happens then? States all across the U.S. are beginning to realize that the money simply isn’t there and won’t ever be there. Kentucky is one of the latest to sound the alarm—but several others have already done as much. What has caused such shortfall in pension funds? And what does it mean for retirees? Toys ‘R’ Us just announced its bankruptcy—which means Amazon’s takeover of the retail industry has just tallied another victim. How did Amazon get to be so big so quickly, and what does it mean for the way business is conducted in the U.S. and around the world? Has the Internet giant really killed the brick and mortar retailer? Whether it is Trump calling Kim Jong Un “Rocket Man” at the UN or Haley blasting Iran; China and Russia calling for a diplomatic solution, or Netanyahu demanding more war in the Middle East—it seems like there is never any end to the thirst for more intervention, more bombs, more bullets, and more boots on the ground. What is the cause of all this tension, hysteria and military pursuit? And what has been the outcome, time and time again? The cause and effect essay is all about picking a good subject that has a lot of ins and outs. Follow the threads to origins and follow them to outcomes. Identify the main ideas that help explain the subject from this perspective and develop a solid outline that will allow you to steer the essay to completion. We’ve given you lots of great possible topics to try out on your own and even provided a few instructions on how to follow through on each step. So when you go to write your essay, just remember to be as thorough as you can, provide substantial evidence to back up your claim, reference and cite your sources appropriately, and revise, revise, revise! 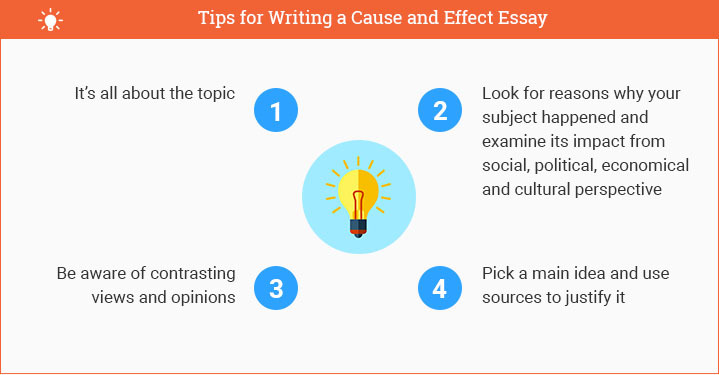 "How to Write a Cause and Effect Essay (in 5 Steps)." Aceyourpaper.com. Student Network Resources Inc, 20 September. 2017. Web. 20 April 2019. Student Network Resources Inc. "How to Write a Cause and Effect Essay (in 5 Steps)." Aceyourpaper.com. 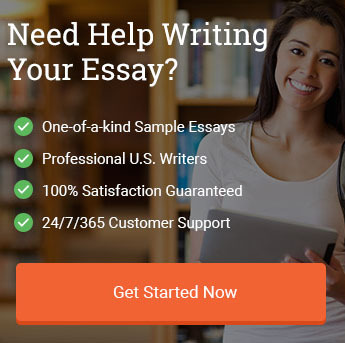 https://www.aceyourpaper.com/essay-writing/cause-and-effect-essay/ (accessed April 20, 2019).